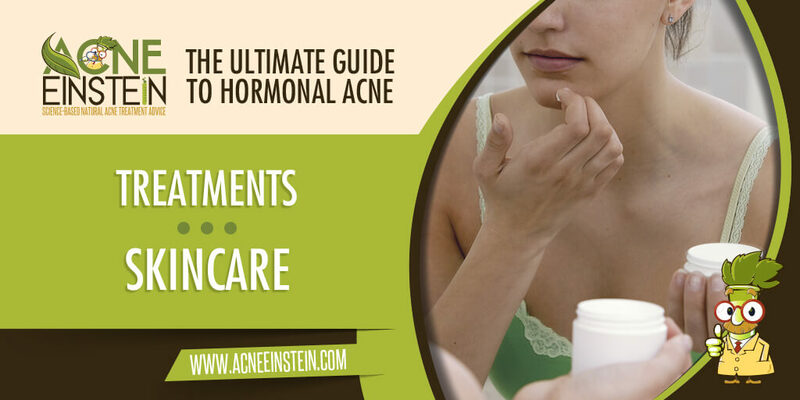 Aside from one exception, topical skincare for hormonal acne is the same as for other types of acne. That exception is topical DHT blockers. Earlier on this guide we went over why drugs and supplements that block DHT don’t work in acne. Because the conversion happens in the skin and orally taken DHT blockers can’t reach the skin. Well, you can also use DHT blockers topically, and there are some great natural options you can try. Just to be clear, the correct term for a DHT blocker is a 5-alpha reductase (5-AR) inhibitor. 5-AR is the enzyme that converts testosterone to DHT; inhibiting or blocking the enzyme hinders the conversion and reduces DHT production. Some of the product links on the page are affiliate links, and I may get a small commission from the merchant. A handful of studies have looked at the effect of various natural DHT blockers on sebum production. Before you get too excited, I need to say that most of these studies are weak. I wouldn’t be surprised if they overstate the effect. Green tea contains a catechin (antioxidant) epigallocatechin gallate (EGCG), which is a potent DHT inhibitor (source). Going by this, Pakistani researchers thought that a lotion with green tea extract could reduce sebum production. They created a lotion with 3% green tea extract and asked 10 volunteers to apply the lotion. They tracked sebum production at the start of the study and once a week for 8 weeks. This chart shows the reduction in sebum production. Source: Mahmood, T., Akhtar, N., Khan, B. A., Khan, H. M. & Saeed, T. Outcomes of 3% green tea emulsion on skin sebum production in male volunteers. Bosn J Basic Med Sci 10, 260–4 (2010). These results look impressive, but I would take them with a grain of salt. This was a small study with no control, and it’s very likely this study overstates the effect. Another study tested two different green tea formulations, one with 5% green tea extracts and another with 2.5% green tea and 2.5% lotus flower extracts. Both lotions caused about 30% reduction in sebum production as compared to a placebo lotion. The polyunsaturated fatty acid gamma linoleic acid (GLA) is another potent DHT blockers. And when applied topically, saw palmetto could also work. A study published in the Journal of Cosmetic Dermatology showed that a lotion with argan oil and extracts from saw palmetto and sesame seeds resulted in 20% reduction in overall sebum level and 42% reduction in oily areas on the skin. Rosehip seed oil and argan oil, while little lower in GLA content, are also excellent candidates. Based on the information above, I listed a handful of products that I think are good options for people with hormonal acne. Many with acne wouldn’t dream of applying oil on the skin, but oils have a long history in skin care, and the right oils can be helpful even on acne-prone skin. You don’t have to buy expensive ‘skin care oils’. Single source oils (borage, evening primrose, rosehip seed, etc.) from health food stores work just as well as the same oils found on cosmetics counters. Just make sure the oil is packed in a dark bottle. Transparent bottles don’t do a good job in protecting the fragile fatty acids. Whatever you do, don’t use olive oil on your skin, and you should also be careful with coconut oil.